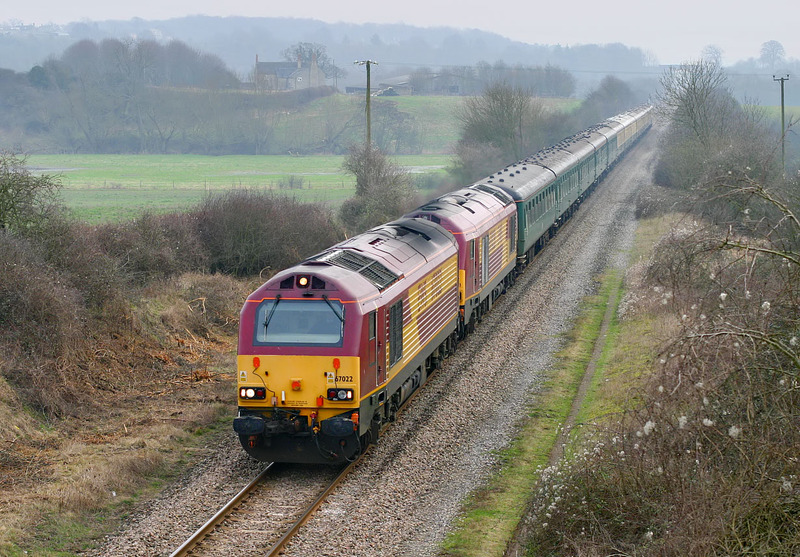 The Class 67 lost its reson detre with the cessation of mail trains, for which they had been specifically designed. This has led to their use on freight trains and possibly the most unsuitable job imaginable for a 125 mph loco with a ridiculously heavy axle weight - the Fort William sleeper. Here we see them on slightly more normal duties, although why it takes two I have no idea. 67022 & 67028 pass Whitehill, on the Cotswold Line with the Hertfordshire Railtours 1Z67 07:21 Finsbury Park to Kidderminster 'Severn Valley 1960's Gala' railtour on 21 February 2004.